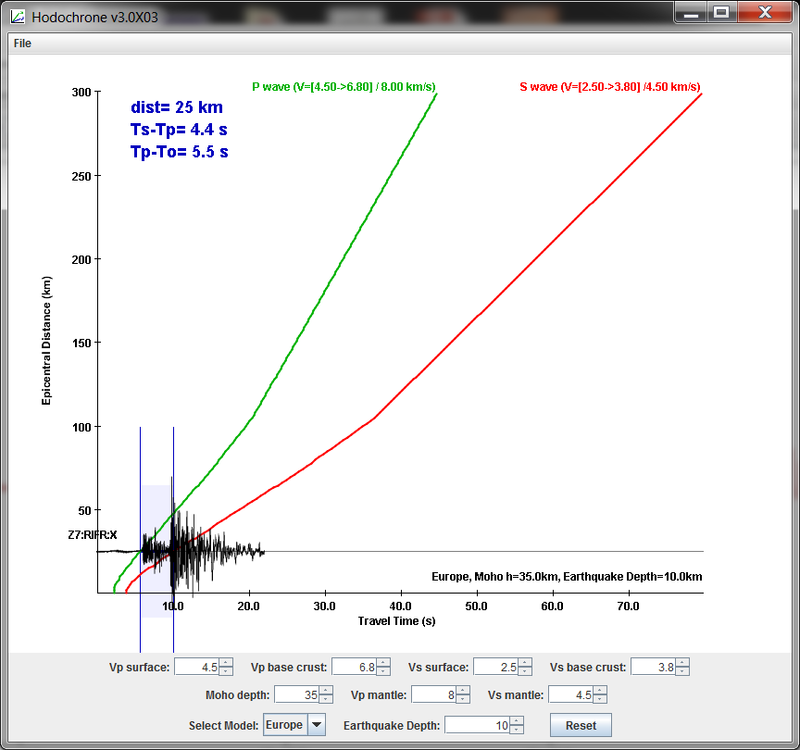 The EQInfo smartphone app is really good for visualizing earthquakes. It shows a list of recent quakes. You could enter your station in the configuration of EQinfo, and then see the waveform recorded for any of the recent earthquakes, and EQinfo already takes into account the time it takes for the waves to arrive at your station. By tapping at the waveform, you can open the filter dialog and then adjust the filter band to see if that makes a difference. Once you find a good example earthquake, you can look at it in Swarm. It’s useful to use the spectrogram view with the frequency on the y axis, and time on the x axis. That kind of plot will show you (encoded in the color of the plot) in which frequency band the earthquake is detectable and which frequency bands are dominated by environmental/cultural noise. The helicorder is not updated in real-time. For real-time data use Swarm or seisgram2k. You can adjust the helicorder’s scale by visiting the Raspberry Shake’s webpage at http://rs.local/ >> Settings >> Advanced >> Helicorder Scaling Value. The programs listed here are installed on your desktop or laptop computer and not on the Raspberry Shake itself. They are third-party programs that were not developed by the Raspberry Shake team. We have made modifications to them or to Raspberry Shake itself to ensure compatibility. Since many of the programs below work in real time, it is important that your local desktop computer or laptop where the programs are executing has correct time. Most computer can easily sync their system times to “Network Timing Protocol” or NTP servers. There are a lot of programs available that you can install locally on your desktop or laptop computer for data visualization and interrogation. These programs generally connect remotely to your Raspberry Shake via a special communication protocol called SeedLink. In the case of Swarm, you can also easily connect to the Raspberry Shake Community server to see waveforms from all of the other Raspberry Shakes in the world- and there are HUNDREDS of them! 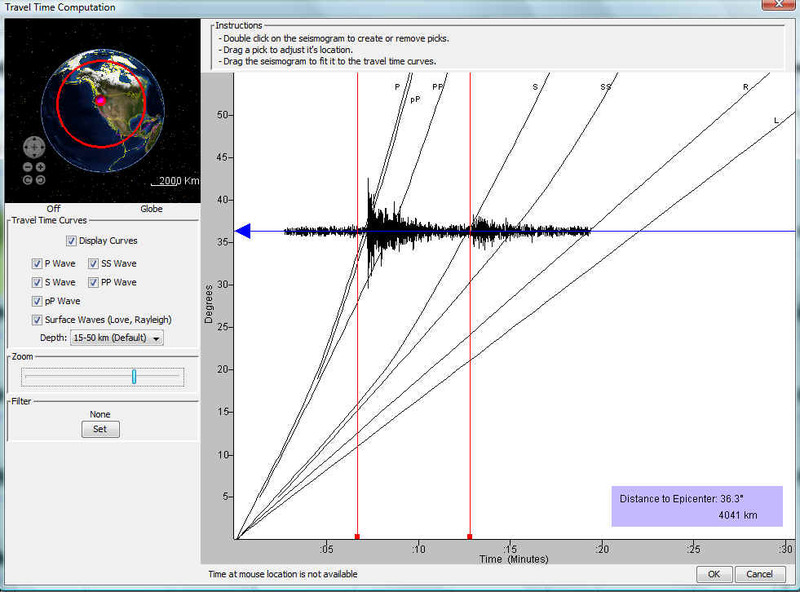 jAmaSeis, a program for visualizing waveform data, and determining earthquake locations/ magnitudes, was developed by IRIS for the Seismographs in Schools program. Raspberry Shake funded the changes need to make jAmaSeis Raspberry Shake and SeedLink-compatible in early 2017.
jAmaSeis, which is installed on your desktop or laptop runs on all platforms (Linux, MAC, Windows) and connects remotely to your Raspberry Shake to acquire the waveform data. jAmaSeis can be downloaded from the IRIS website at jAmaSeis. Click here for the official jAmaSeis Manual and operating system-specific installation instructions. For our step-by-step and operating system-specific installation instructions see: jAmaSeis Installation Guide. Choose File >> Add Source. This will open both the “Sources Manager” and “Add Source” windows. Click on the “Raspberry Shake” button. This will close the “Add Source” window and open the “Raspberry Shake source” window. Leave the IP:Port default as “rs.local:18000” or change “rs.local” to your Raspberry Shake’s actual IP address. Notice that whereas Swarm runs on port 16032, jAmaSeis runs on port 18000.
jAmaSeis connects to the Raspberry Shake’s SeedLink server on port 18000 which is a real-time data server. The server has a buffer with some hours of data. But when that data is written to disk and cleared from the server’s memory buffer, it is no longer accessible by jAmaSeis. This is a big difference as compared to Swarm, for example, which connects to the OSOP Wave Server which has access to both real-time and archived data. So, if you are trying to use jAmaSeis to look at data a few days old and nothing is plotting up, this is the reason. Click on the “Get Stations” button that appear beneath the IP field. This will interrogate the Raspberry Shake’s local SeedLink server and autopopulate the field for you. Hit the “OK” button which will close the “Raspberry Shake source” window and bring you back to the “Source Manager” Window. You should see your Raspberry Shake listed as a source. Click on “OK” at the “Sources Manager” screen. The helicorder plot of your Raspberry Shake should now appear in the main window. Give it a minute or two to populate the data. The school version of the software also contains simple filter and spectrum/ spectrogram tools. Click here for a short guide on how to use the software. For our step-by-step and operating system-specific installation instructions see: seisgram2k Installation Guide. $ java -cp SeisGram2K70_SCHOOL.jar net.alomax.seisgram2k.SeisGram2K  -seedlink "rs.local:18000#AM_R5DCF:00SHZ#300"
Replace “R5DCF” with your Raspberry Shake’s station name and “SHZ” with the proper Channel Code (for more information see: Raspberry Shake Naming Convention). Notice that whereas Swarm runs on port 16032, seisgram2k runs on port 18000. $ java -cp SeisGram2K70_SCHOOL.jar net.alomax.seisgram2k.SeisGram2K  -seedlink "rs.local:18000#AM_R5DCF:00EH?#300"
Replace “R5DCF” with your Raspberry Shake’s station name and “EH?” with the proper Channel Code (for more information see: Raspberry Shake Naming Convention). Notice that whereas Swarm runs on port 16032, seisgram2k runs on port 18000. And similarly replacing “R5DCF” with your Raspberry Shake’s station name and “SHZ” with the proper Channel Code (for more information see: Raspberry Shake Naming Convention). 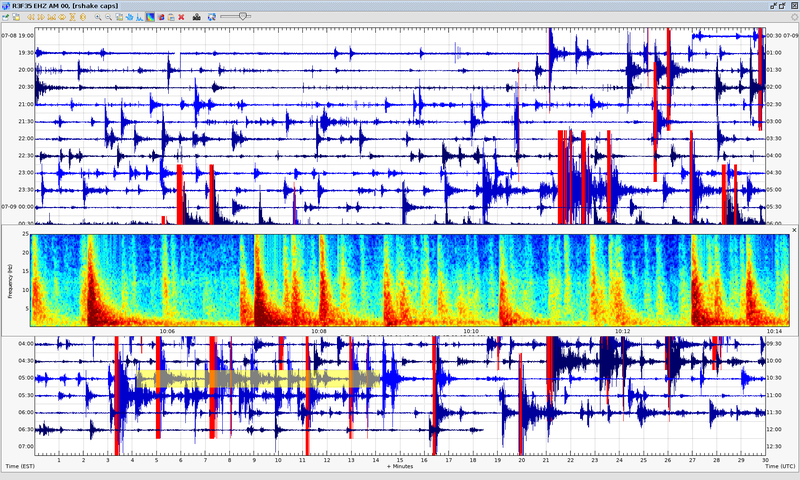 Then save the file to the Seisgram2k directory as “Seisgram2k.bat”. Then you can click to open the batch file and this will load Seisgram2k and connect to your Raspberry Shake. Swarm is an extraordinary and useful tool that will allow you to enjoy, explore, discover and understand earthquakes in a simple way. Swarm allows you to visualize the seismic data from your Raspberry Shake from your desktop or laptop computer. Swarm was developed by the USGS Volcano Hazards Program and is easily the most widely used seismological application. It runs from your desktop or laptop computer on Linux, MAC and Windows and remotely accesses the data from your Raspberry Shake. July, 2018 Volcanic activity at Hawai’i - hundreds of earthquakes per day! You can download the preconfigured Swarm application from http://rs.local >> Actions >> DOWNLOAD SWARM (button). Click here for the USGS’s tutorial on how to use Swarm. For our step-by-step and operating system-specific installation instructions see: Swarm Installation Guide. If you are configuring Swarm on your own, we recommend not using the SeedLink Server Data Source. The SeedLink Server implementation in Swarm only has access to the data currently in the SeedLink buffer. Use the Winston Wave Server Data Source to connect to the OSOP Wave Server instead (Read more about OWS here). The OWS is highly optimized and has the added benefit that it serves what is inside of the SeedLink Server buffer PLUS any data on disk (Raspberry Shake saves the last 7 days of data to disk for this reason). The default Winston Wave Server port is 16022. Raspberry Shake’s OSOP Wave Server connection operates on 16032. Click here to learn more about the OSOP Wave Server (OWS). Data from this data source is not provided in real-time. It is delayed by 30 minutes. You will notice the data updates in the helicorder display but remains at t minus 30 minutes. For real-time data, use the myShake data source referenced above. Click here to learn more about the Common Acquisition Protocol Server (CAPS). Each daily miniSEED file is generally about 15 Mb in size, though the files can be bigger or smaller depending on the actual amplitudes recorded which affect the compression. By default 7 days of continuous data are saved to disk. This is, however, configurable at in the Raspberry Shake’s webpage at http://rs.local/ Settings >> Advanced >> Waveform Data Retention >> Waveform Files Retained for X Days. Be careful when configuring this parameter! You risk filling up the disk space. If this happens, you will not longer be able to access your Raspberry Shake. By default we ship Raspberry Shakes with an 8 Gb micro SD card. We estimate the that OS and software consume ~3 Gb of disk space, leaving you with ~5 Gb for data. At 15 Mb/ day/ channel, that is ~330 days MAX for the RS1D or RBOOM and much less for the RS3D, RS4D or RS&BOOM.